Dhaka, 9 September, Abnews: Prime Minister Sheikh Hasina today called upon Islamic Development Bank Group (IsDBG) to take definite actions for repatriation of the displaced Rohingya citizens of Myanmar to their home. She said Bangladesh has been proactively responding to the unprecedented humanitarian crisis, by keeping its border open and accepting the large influx of forcibly displaced Rohingyas. “But, now we want them to go back to their own land,” she said adding that IsBDG cannot remain silent when Rohingyas are facing ethnic cleansing. “Rohingyas are creating multifarious negative impacts on local community and ecosystem along with our own resources,” the prime minister said. The prime minister said this while inaugurating the Regional Hub of the Islamic Development Bank (IsDB) in Dhaka today. Finance Minister Abul Maal Abdul Muhith, president of the Islamic Development Bank Dr. Bandar M. H. Hajjar, Economic Resources Division (ERD) Secretary Kazi Shofiqul Azam also spoke on the occasion. The prime minister also sought support of IsDBG to meet the deficit of the investment plan of Bangladesh to address the adverse impacts of climate change. Bangladesh will need a total amount of USD 11.7 billion to determine the investment demand, current investment and investment gap that exist in environment, forest and climate change sector. So far USD 4.7 billion has been invested from internal and external sources, and there is an overall investment deficit of USD 7 billion, she said seeking IsDBG support to meet the gap. 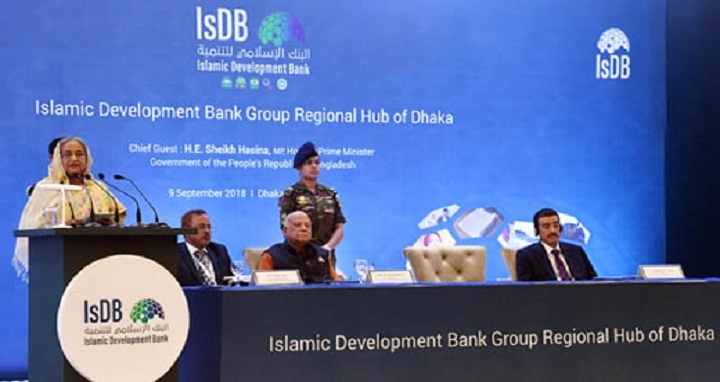 Expressing her firm commitment to build Bangladesh as a middle-income country by 2021 and a developed one by 2041, the prime minister hoped continued support and cooperation of the IsDB. “Together we will build a brighter and prosperous future for our new generation,” she said adding that Bangladesh has already started the SDGs implementation aligning the same with our national plans and strategies with a target to achieve most of the SDGs within 2030. The prime minister welcomed the decision of the IsDBG for opening the regional hub in Dhaka saying it will definitely help IsDBG to speed up its operational activities. This will also help IsDBG to be more intimate and closer to client countries in understanding the development needs and challenges as well as development priorities, she said. Sheikh Hasina said IsDBG is one of the trusted development partners of Bangladesh. Bangladesh acknowledges the role of IsDBG over the last four decades in its socio-economic development. IsDBG has so far extended cumulative development assistance of USD 22 billion to Bangladesh making the country single largest recipient of Group’s economic cooperation among its 57 member countries, the prime minister said. The establishment of new office in Dhaka is also marked as a joint step forward in further consolidating the relations and strengthening the partnership between Bangladesh and IsDBG, she noted. “We are working towards elevating our status to upper middle-income country shortly. We have also set our next target of becoming a happy and prosperous country by 2041,” she said. Sheikh Hasina said, Bangladesh now becomes a role-model of socio-economic development for others and is now globally considered as a ‘development-miracle’. It is the 43rd largest economy in the world in terms of nominal GDP and 32nd in terms of purchasing power parity, she said. The prime minister said in spite of having diverse development challenges, Bangladesh is a unique example of achieving fastest poverty reduction with its limited resource base. Poverty rate declined to 22 percent today. Sheikh Hasina said Bangladesh needs to reap the potential benefits of demographic dividend by creating more employment opportunities. In view of this, the government is working for developing 100 special economic zones, a number of High-tech parks and Software technology parks, and facilitating more private and foreign investment in this regard, she said. “We have undertaken a number of mega projects to take the growth trajectory to further higher level to meet the infrastructure challenges,” she said adding that Padma Bridge is one of such projects, which is being implemented with own resources. Pointing out Bangladesh progress in human resource development, the prime minister said the government has been given due importance to general education, vocational and technical education including the ICT education. Sheikh Hasina also highlighted Bangladesh’s success in health sector saying 18,500 community clinics and union healthcare centers were made operational to reach the health services to the doorsteps of the rural poor and the marginalized community. Maternal and child mortality rates have fallen to 1.76 and 28 per thousand, respectively. Currently, the rate of immunization of infants less than one year is 82.3 percent and the rate of feeding vitamin A capsule is 92 percent. Average life expectancy has gone up to 72 years, she said. ‘Health Window’ has been introduced for providing 24 hours free medical consultancy services, she added. Pointing out success in the power sector, the prime minister said her government’s power generation capacity was 4,942 MW in 2009 that has now increased by four times to 20,000 MW. Sheikh Hasina said Bangladesh has already reached the level of becoming a technology driven ‘Digital Bangladesh’. Extensive IT infrastructure has been put in place to connect even the farthest and remotest corner of the country. “Almost all public services including education, health, agriculture, birth-registration-and social allowance related services are now at the doorsteps of the common people,” she said. Sheikh Hasina said Bangladesh achieved the glory to be 57th member country of the elite satellite club through successful launching of the ‘Bangabandhu Satellite-1’ into the space on 11th May, 2018.